Do outdoor stairs have you stuck inside, avoiding some of your favorite activities? Slippery surfaces, uneven pavement, and inclement weather can make porch, patio, and deck stairs can be especially hazardous. 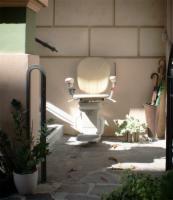 Luckily, an outdoor stair lift from AmeriGlide can improve your safety, decrease the risk of falls, and allow you to get back to gardening, enjoying your outdoor spaces, and enjoying greater mobility all around. At AmeriGlide of Southport, North Carolina, you can test drive our outdoor stairs lifts and see for yourself how comfortable and easy to operate they really are. All electrical components are sealed and protected to withstand all moisture and all types of weather so that you can enjoy your stair lift for years to come. Each model also comes with an unbeatable warranty and protective covering to keep the seat clean and dry. Visit our local Southport, NC showroom today to speak with an expert and place your order today!